Lontra's LP2 blade compressor on show at Hannover Messe. 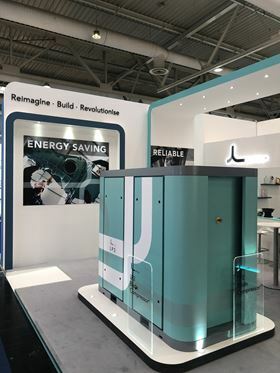 UK engineering company Lontra has recently unveiled its LP2 Blade Compressor range for use in low pressure and blower markets such as pneumatic conveying, water treatment and aeration. The new range has been designed for continuous operation and the company says it expects it to offer energy savings of more than 21%. The machine delivers up to 2250m3/hr (1325 cfm) at a pressure of up to 1 bar(g) (14.5 psig) and has been designed to include the latest in IoT monitoring, which includes the remote transfer of real-time data on the compressor as well as permanent magnet motor technology. Consortium awarded £1.5 million grant to apply Blade Compressor as a turbo compounding technology.